Konami: New engine will create "a surprising football game"
In an interview with OPM UK, Manorito Hosoda - Marketing Producer at PES Productions - has discussed how the introduction of a new engine may affect the future of the Pro Evolution Soccer series. "We are not using the FOX Engine. We’re just sharing the fundamental part of it with Kojima Productions. We have to tailor the engine specifically for football games. "Having that engine we are sure that we’ll be able to create a surprising football game – for instance we may be able to reflect the user’s emotion in the game. 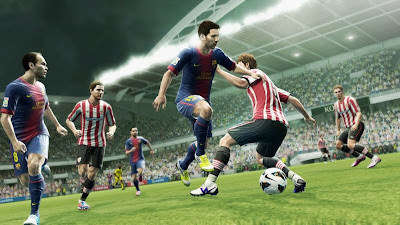 "The ultimate goal is perfect realism, but if we create such a game the controls will be too difficult. In order to have realism and entertainment elements, our goal will be to link users’ emotions with the in-game players’ emotions. We’d like to link user emotion with every aspect in the game." Rewinding back to the present, Gamescom kicks off tomorrow with lots of new PES 2013 content expected. Tomorrow morning, Konami will release a new trailer - with many more things lined up for all five days of the event in Cologne. In other news, Konami have announced that PES outsells FIFA with an impressive ratio of 4:1 in Latin America.